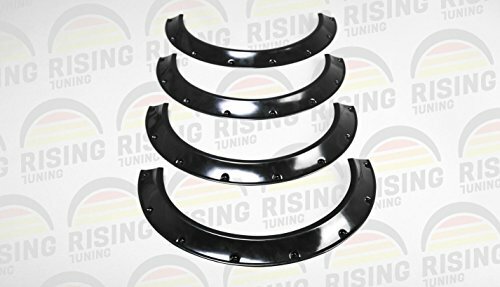 A set of four 10cm (4 inchs) wide fender flares made of high-quality 3mm thick ABS plastic in the Modern widebody style. This is a large version for R17-R22 wheels. The product is lightweight and can be installed without affecting the weight of your car. May be blended in with your car body or left with open rivets. There may be small scratches on the plastic, as the product is delivered as "to be painted", but can be used as is. Surface finish: Black glossy. This is a universal product (The flares can fit on many customized models. Make sure the dimensions of the flares match your wheel well opening) Heat up the flares with a heat-gun and install them to follow the car body lines. Please, read before ordering: Your original fender flares andor quarter panels must be drilled and cut to be installed on your car. 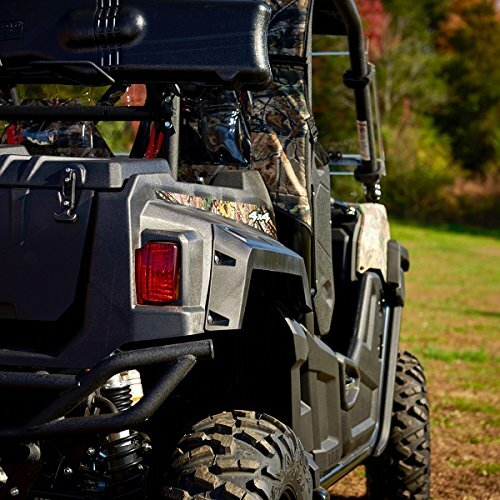 Our overfenders can be installed on rivets or bolts - you will need to drill your stock fenders and quarter panels. 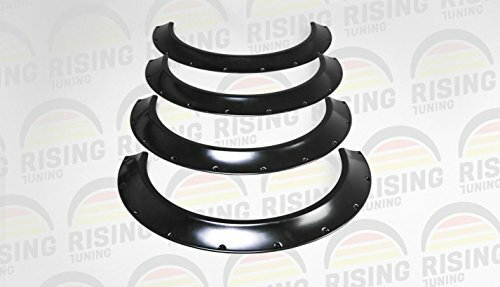 A set of four 4cm (1,6 inchs) wide fender flares made of high-quality 3mm thick ABS plastic in the Modern widebody style. This is a large version for R17-R22 wheels. The product is lightweight and can be installed without affecting the weight of your car. May be blended in with your car body or left with open rivets. There may be small scratches on the plastic, as the product is delivered as "to be painted", but can be used as is. Surface finish: Black glossy. This is a universal product (The flares can fit on many customized models. Make sure the dimensions of the flares match your wheel well opening) Heat up the flares with a heat-gun and install them to follow the car body lines. Please, read before ordering: Your original fender flares andor quarter panels must be drilled and cut to be installed on your car. Our overfenders can be installed on rivets or bolts - you will need to drill your stock fenders and quarter panels. 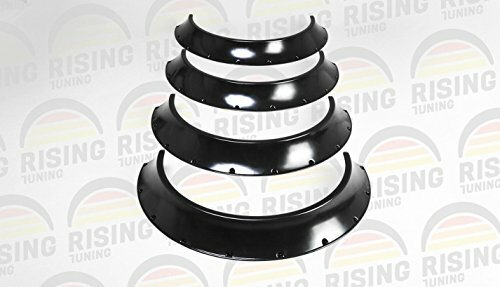 A set of four 3 cm (~ 1,2 inches)wide fender flares made of high-quality 3mm thick ABS plastic in the Modern widebody style. 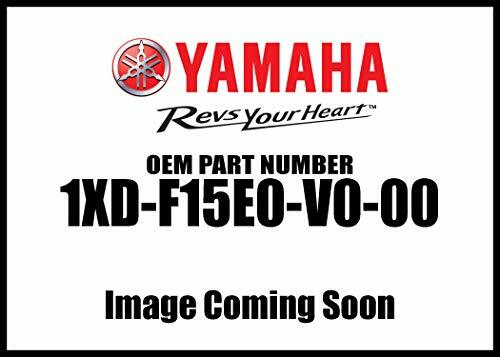 This is a short version for R13-R16 wheels. The product is lightweight and can be installed without affecting the weight of your car. May be blended in with your car body or left with open rivets. There may be small scratches on the plastic, as the product is delivered as "to be painted", but can be used as is. Surface finish: Black glossy. This is a universal product (The flares can fit on many customized models. Make sure the dimensions of the flares match your wheel well opening) Heat up the flares with a heat-gun and install them to follow the car body lines. 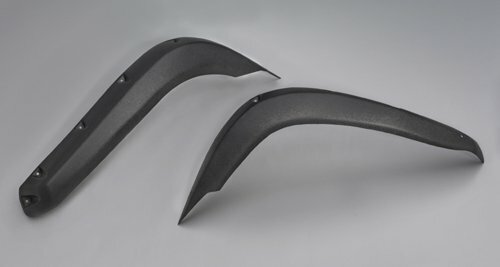 Please, read before ordering: Your original fender flares andor quarter panels must be drilled and cut to be installed on your car. Our overfenders can be installed on rivets or bolts - you will need to drill your stock fenders and quarter panels. 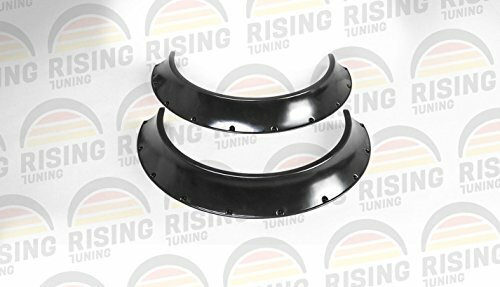 A set of two 10cm (4 inchs) wide fender flares made of high-quality 3mm thick ABS plastic in the Modern widebody style. This is a large version for R17-R22 wheels. The product is lightweight and can be installed without affecting the weight of your car. May be blended in with your car body or left with open rivets. There may be small scratches on the plastic, as the product is delivered as "to be painted", but can be used as is. Surface finish: Black glossy. This is a universal product (The flares can fit on many customized models. Make sure the dimensions of the flares match your wheel well opening) Heat up the flares with a heat-gun and install them to follow the car body lines. Please, read before ordering: Your original fender flares andor quarter panels must be drilled and cut to be installed on your car. Our overfenders can be installed on rivets or bolts - you will need to drill your stock fenders and quarter panels. 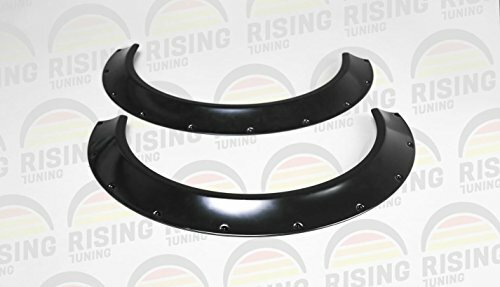 A set of two 4cm (1,6 inchs) wide fender flares made of high-quality 3mm thick ABS plastic in the Modern widebody style. This is a large version for R17-R22 wheels. The product is lightweight and can be installed without affecting the weight of your car. May be blended in with your car body or left with open rivets. There may be small scratches on the plastic, as the product is delivered as "to be painted", but can be used as is. Surface finish: Black glossy. This is a universal product (The flares can fit on many customized models. Make sure the dimensions of the flares match your wheel well opening) Heat up the flares with a heat-gun and install them to follow the car body lines. Please, read before ordering: Your original fender flares andor quarter panels must be drilled and cut to be installed on your car. Our overfenders can be installed on rivets or bolts - you will need to drill your stock fenders and quarter panels. 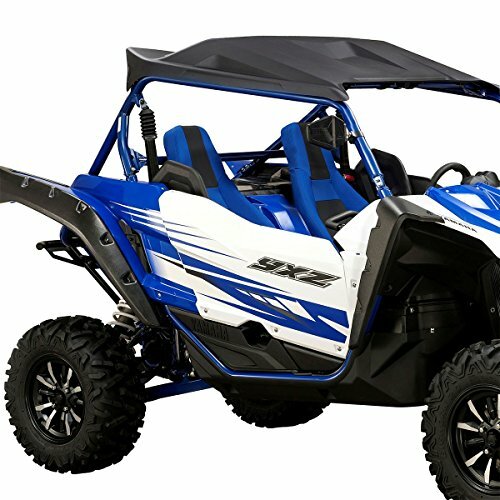 Compare prices on Overfender Set at LiveSaler.com – use promo codes and coupons for best offers and deals. We work hard to get you amazing deals and collect all avail hot offers online and represent it in one place for the customers. Now our visitors can leverage benefits of big brands and heavy discounts available for that day and for famous brands. We try to makes comparison shopping easy with Product Reviews, Merchant Ratings, Deal Alerts & Coupons. Find Deals, Compare Prices, Read Reviews & Save Money.